Richard heads for Chittagong. Its officially off limits, so he is sorting himself out and he arrives on time – lucky him! We are off the Cox’s Bazar and our flight is delayed. So we arrive late in the dark and a tuk-tuk takes us down the coast about 25 mins. Well for Julie and I – ours is electric. Ian is latter 45 mins as his is diesel. Getting sorted late, hot water etc. is a bit of a nightmare, and we end up change rooms – a roomier shared bungalow. Dinner under the trees is OK though. They try and screen a movie on a table cloth looking out to sea! Better in the light. Ian thinks a rat was looking at him from the roof – no Ian it’s a mongoose! Dual rooms work well for the 3 of us. We get a western style breakfast with cornflakes all rather nice. Take the hotel boat across river to beach. 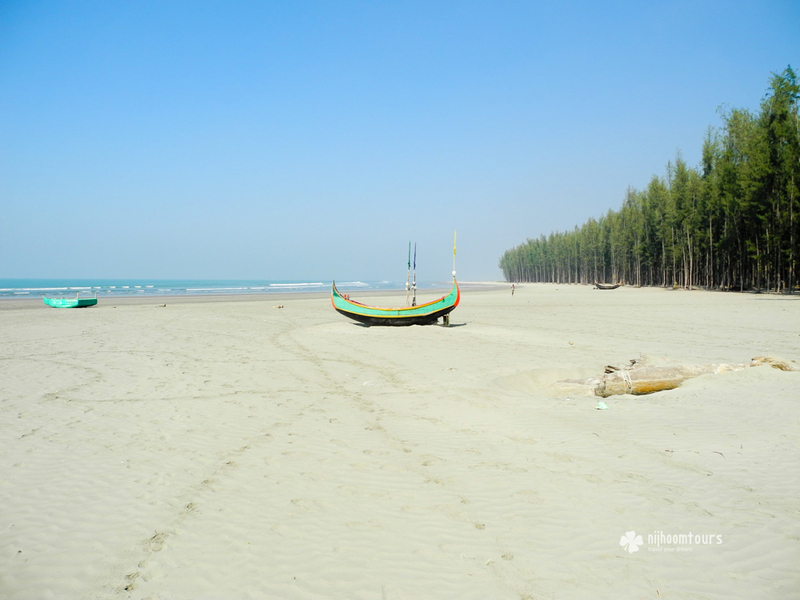 125 km long, the world longest natural beach, is lovely and there are no tourists just a few local fishermen with very small insignificant catches. So we take a nice walk out and back to the small boat. OMG the tide is out to reach the boat its sandals off and a walk in slimy clay like sand which I hate. It’s my worst nightmare – one because I could well slip over, and 2 because well I just don’t like it! In the mud are mud skimmers, so then I worry I am treading on them! Not nice but I manage to get back to the boat – trousers a bit wet at the bottom and I was in my new shamwaar kameez! We do meet an English guy walking the length of Bangladesh for an NGO! We get a very expensive beer back at the lodge and its 12%. Take a rest and read some. Do a spot of bird watching, then dinner under the magic tree. It is really nice, a bit chilly, so they light us a brazier. This place is really delightful! Breakfast in the sun cooked to order is superb. Walk to beach over bridge, some new kingfishers spotted en route. Small catches of fish again today. Few folk bother you. No small birds? Lodge is lovely we are only guests today. Boys with catapults – that answer’s the bird question then. It is a lovely place. Dinner under stars, in fact showers under stars! Not too many creepy crawlies – Oh and the mongoose is in fact a squirrel. Oh and one smuggled whiskey miniature between 3. God the beds are hard. Breakfast in the sun again. It’s a shame we have to leave today. Cox’s Bazar was an unexpected additional due to the last minute change in itinerary, and it’s really worked well. Would have been ideal at the end of this trip. I would love to return. Pleasant ride along coast to airport. Himchari looks a nice place to stay. Small airport has huge military presence due to ongoing political problems. Things seem to be hotting up. Richard is due back into Dhaka also tonight. Quite late. Eco lodge is perhaps the best accommodation we will get on this trip – downhill to 2014 then! Our flight is delayed again. The 3 of us eat out as same place as before, and we wait up for Richard who get in after 11pm. Seems to have done OK, though his hotel was not very good – mice in the dining room. If he says it’s not good, well goodness it must be awful. If you’ve missed the previous parts of my diary, you can start reading it from here: Diary of my first 03 weeks trip to Bangladesh (Part – I). Also can read the next part here: Diary of my first 03 weeks trip to Bangladesh (Part – IV). Consider sharing the story in social media so that more travelers can know about this amazing country which is little known to everyone. Enjoy!